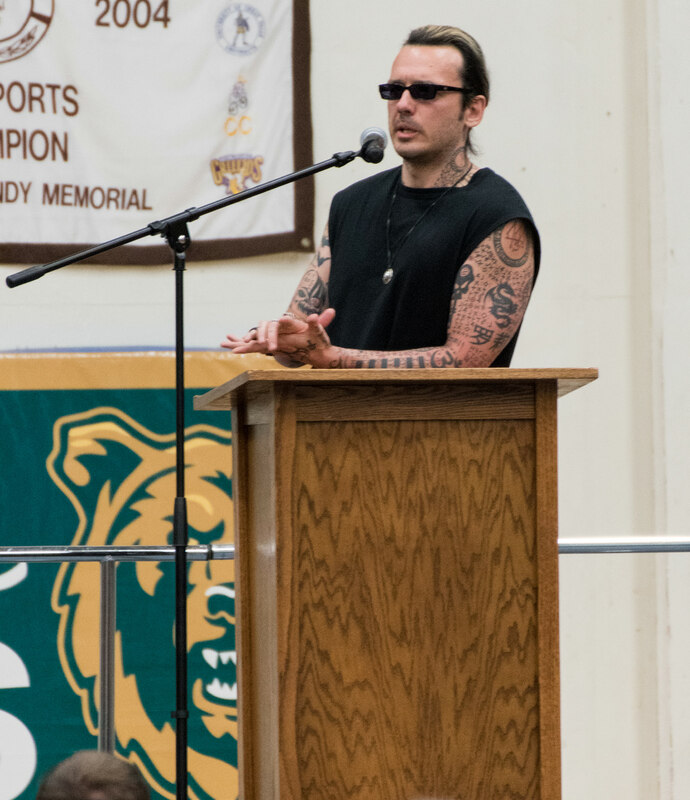 Damien Echols speaks at the Common Read Lecture last Thursday. photo courtesy of Ean McLaughlin. 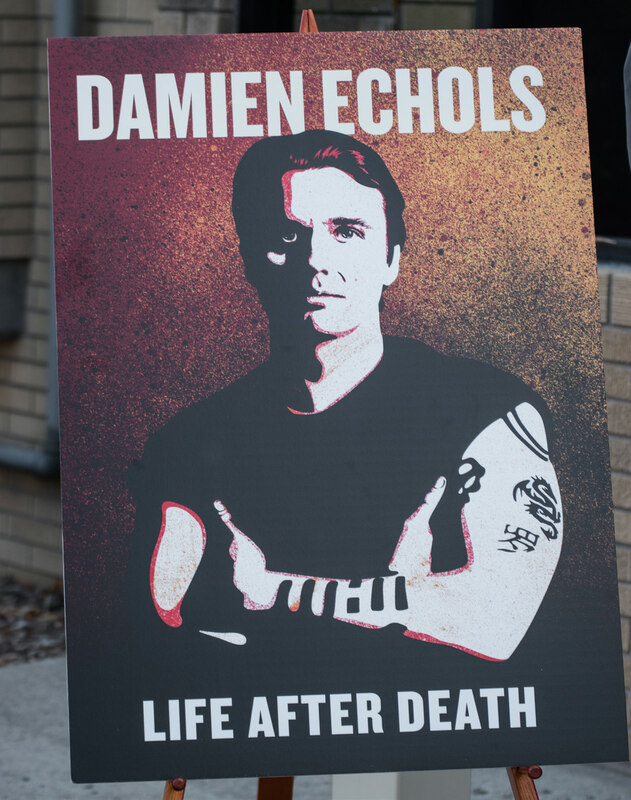 “Life After Death” is Echols’ account of being wrongly accused and convicted of the satanic killing of three young boys in 1994. Echols spent 18 years on death row before being released in 2011. Echols’ physical appearance stood out. He wore sunglasses, a black cut-off smock, black pants, combat boots, and a large silver skull-shaped ring on his hand. His highlighted jet black hair was slicked back and his pale skin was covered in tattoos that he designed himself. Perhaps what stood out more than his appearance was his calm demeanor and eloquent storytelling. He began the presentation by describing his first weeks in prison. He told of how the prison guards placed him in solitary confinement, in “the hole,” which was a small, filthy, secluded room in the back of the prison. Echols continued to describe the horrors of prison life and spoke of the people who helped him make it out alive. He told of a deacon from the Catholic Church who regularly brought communion to the inmates on death row and who found out about Echols’ horrific treatment in the hole. It wasn’t until the deacon threatened the warden that he would expose Echols’ inhumane treatment to the outside world that he was removed from solitary confinement. The heroic acts of individuals bringing injustice to light was a theme Echols spoke on throughout the night. He gave credit to the people who made the documentaries and television shows that initially brought his case to the public eye. After discovering Echols’ case, celebrities including actor Johnny Depp and Eddie Vedder of Pearl Jam led a movement to free Echols. This included widespread protests and fundraising that covered court costs and further investigation of the case. Eventually, in 2011, Echols and the two other defendants were released on an Alford plea. Echols explained the concept of an Alford plea early in the lecture. photo courtesy of Ean McLaughlin. Echols said that the state of Arkansas avoided an evidentiary hearing, which he believes would have eventually resulted in his acquittal, by threatening to use appeals and extensions to drag the case out for at least another five years. Echols said he is often asked if it was hard to accept the Alford plea after years of standing by his innocence. He also gave credit to his wife, Lorri Davis, for saving his life. Davis began writing letters to Echols in 1996 after she discovered his story through the documentary “Paradise Lost.” Davis and Echols wrote an account of the couple’s love story on death row, “Yours for Eternity.” Davis attended the lecture on Thursday. During the second half of the lecture, Echols opened the floor to questions. Students, faculty, and members of the community asked questions covering topics ranging from his tattoos, to his relationship with Johnny Depp, to more specific questions about the case. One question was whether he saw any similarities between his case and recent cases of racial profiling by law enforcement and in the justice system. Echols said that while he does see similarities, he believes that there is more to the issue than race. Echols said that if his story prevented corruption and injustice in the future, then his time was well spent. After the lecture Echols signed copies of “Life After Death” and spoke with individual members of the audience for over an hour.